"I’ve always been a pretty excitable person but I find myself more stimulated by just living life than ever before. I believe, more than ever, that you shouldn’t spend one second of one day cross with a neighbor or at odds with any person or situation that doesn’t directly affect your life or livelihood. " My dear friend, The Soldier, wraps up his blog with a final entry. He has moved to Florida. As much as I miss him, I am happy for the great business opportunity he has found there. I bet local blogger and George Mason alum Jon Lowder is tipping a few bottles over this win. George Mason has had an amazing run to the Final Four. They knocked out three recent national champs, including a Michigan State team that was largely intact from last year's Final Four squad. I was impressed with their composure after allowing Connecticut to come back at the end of regulation. Most teams, even experienced teams, would have folded in overtime. George Mason revealed they are confident, well coached, and fearless. I caught part of the Pete Maravich special on CBS this afternoon. I was too young to see him play during his storied college career, but seeing footage of him today brought back memories of stories my dad told me when I was growing up. My dad and Pete were the same age, so they spent time together when they attended the Campbell College Basketball School. Dad told me Petie, as he was known then, was a prodigy even at 10 and 11. He could do things with a basketball that the high school campers couldn't touch. Campbell invented the basketball camp, and they had every major college coach and player they wanted as instructors. At the end of the week, the all-star campers always played a team of college players. Despite being much younger than the other good players, Petie starred for the campers' team. My dad said that even though he had to shoot a two-handed set shot to get the ball to the basket, Petie made everything in sight. Even at ten years old, Pete knew how to please a crowd. I missed most of the Texas-LSU game since I was at work, but I got to see a fair amount of the Memphis-UCLA game. The shooting was incredibly poor. I have never seen so many air balls and bricks off the glass. Even the UCLA's last point came on a banked free throw. These weren't even contested shots. I saw wide open look after wide open look either miss the rim or draw back iron. Did they set the rims at the wrong height? That seems possible since the Oakland Regional was played in San Francisco. Guilford Country schools superintendent Terry Grier is one of three finalists for the same position with the Charlotte-Mecklenburg school system. That he is down to the final three there seems strange in so many ways. Charlotte has long held a generally superior attitude when viewing Greensboro, so it is hard for me to picture them wanting something we have. Grier is also incredibly unpopular with a significant percentage of parents in Guilford County. I would have guessed those two factors would have impeded his progress in the Charlotte application process, despite any other credentials he could muster. Personally, I would be pleased to see Grier leave Guilford County. My biggest beef with Grier is that he torpedoed the successful character education program in local schools, despite the fact the program was funded primarily with private dollars and grants. Grier then denied he killed the program and repeatedly cited inaccurate cost savings figures, even after acknowledging privately that his figures were bogus. At that point, he convinced me he of his disdain for core character education values like honesty, integrity, and personal responsibility. I wonder if it's too late to send a letter to the Charlotte school board supporting Grier's candidacy? Ed Cone has speculated more than once that the future of blogging may include many that cover specialized topics, like community sports or sewing. JR was kind enough to point me to just such a blog recently, The Pour. The Pour is written by the NY Times' chief wine critic, Eric Asimov. Ed probably envisioned something a little more local, but a big wine blog like this might lead to smaller ones. Asimov is off to a good start in blogging. As you might expect, even as a newbie his audience dwarfs most bloggers. Part of that is the Times' volume, and part of that is his conversational approach to covering wine. I keep hoping longtime News & Record wine columnist Ed Williams will start blogging. He is particularly strong in the almost lost art of finding high quality wines that don't strain the wallet. And I bet Ed would get lots of useful tips from his blog readers, since no one can cover all of the wines being produced. Since Kristen has been pregnant or nursing for the last ten months, we have taken a lengthy break from our typical wine consumption. We both look forward to getting back into our old routine in a few months. Until then, The Pour will have to suffice, unless Ed decides to get in the game. I am defending champ in two NCAA pools this year. I manage one, and the other is made up mostly of employees of a local large company. I am tied for the lead in the latter, but I do not like my chances to repeat. It is a pool where players pick the entire tourney in advance, and I will have to get some breaks along the way. I am tied for 16th out of 53 in the pool I manage. That pool allows players to pick the first two rounds, then pick the next two rounds with a fresh sweet 16 bracket, then pick the final four. That system keeps everyone interested and competitive. In other words, if you had Carolina or Kansas going deep in my pool, you are not sunk. Since I run the pool and there is the opportunity for impropriety, I always give my picks to other participants before the picks are due. Here are my third and fourth round picks on my #1 sheet. Atlanta: Duke squeaks by LSU, and Texas handles West Virginia. Duke advances over Texas. Oakland: Memphis beats Bradley, and UCLA has too much for Gonzaga. UCLA avenges an earlier loss to Memphis and goes to Indy. Washington, D.C.: Wichita St edges George Mason, but Connecticut wakes up and beats Washington and Wichita State by double digits each. Minneapolis: Boston College upsets Villanova, and Florida just gets by Georgetown. BC advances. "So, when your two main rationales for going to war in the first place turn out to be wrong, how can you say other than that it was a mistake? Wrong is wrong. We can keep compounding the mistake or we can learn something. " David Boyd has changed his mind about the war in Iraq. Originally a supporter of the war, he now believes it was based on bad intelligence about WMD and the naive notion that coalition forces would be received as liberators. President Bush sold the war as one of necessity. When he tried to justify the war by trying to tie Iraq to 9/11 and saying Iraq could attack the U.S. in 45 minutes, I had serious doubts about everything else he said about Iraq. I figured if those statements were the best he could do, his motives and intelligence were pretty flimsy. David Boyd has my respect for reconsidering his public position about Iraq with honesty and maturity, rather than continue to sing a party line most people do not believe. I wish President Bush would follow David's lead by assessing the situation honestly and acknowledging the mistakes, so the entire country could turn its focus to bringing the situation to a reasonable conclusion. "When N.C. State won its 10th ACC Tournament championship in 1987, Duke had won just six and Carolina also had 10. Now Duke has 16 titles and Carolina has 15. It has been a long time for a fan base that doesn’t like being the third wheel in the neighborhood." From Tom Suiter, North Carolina's best sports anchor, at WRAL's ACC sports blog. 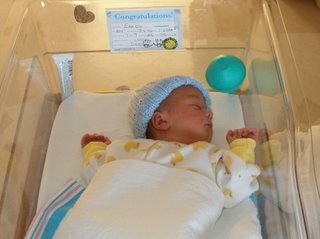 I finally have some pictures to post from our newest family member, John Patrick Eakes. Here he is hanging out about five hours after he was born. Soon after we took the picture shown above, big sister Sarah arrived to check out the scene. 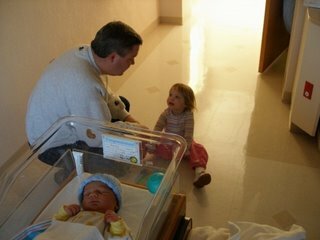 Kristen and I had been talking to Sarah for a few weeks about her pending sibling, but nothing could fully prepare her for actually seeing the new baby. This is Sarah meeting John for the first time. That meeting went well, and she has continued to be gentle with him since then. I am sure the fact that John was born bearing gifts for Sarah has nothing to do with the smooth transition. I manage an NCAA pool, so I am posting my picks for the first two rounds here. No need to even have an appearance of impropriety. It's hard to imagine that any school in the country has improved its football facilities more than NC State during the past five years. Carter-Finley Stadium has added new seats in both end zones, a state of the art training center, new press boxes, and luxury suites at Carter-Finley stadium. In addition, the RBC Center (jointly paid by NC, Wake County, and NC State) opened for basketball and hockey in 1999. The man behind those improvements is Wolfpack Club head Bobby Purcell. He has raised a mountain of cash since taking the reins in 1997. In the most recent fiscal year, the Wolfpack Club raised 40% and 60% more than Duke and Carolina, respectively. Purcell is well known for his ability to recall names and facts when dealing with his 20,000 members. I saw it first hand a month ago at a breakfast in Greensboro. He walked right up to my best friend and apologized for the Wolfpack Club not getting seat cushions delivered to his football seats this past fall. We were both dumbfounded. Of course, with large donations come larger expectations. The heavy dollars flowing into Raleigh for facilities improvements only increase the pressure on Chuck Amato and Herb Sendek. This is the 15th year I have run an NCAA pool. In our pool, you pick only rounds one and two at the start. After those rounds, you are issued a fresh bracket with the 16 teams that are still alive, then you pick rounds three and four. Then, the same routine for the final four. This format means no pool player is eliminated if his/her tourney winner pick loses in the second round. Every pool player has a chance to make up ground with good picks after the tourney starts, since each round is worth more points than the previous round. Most NCAA pools require you to pick the entire tournament in advance. Our pool players have the chance to stay in the race to the very end, regardless of an upset here or there. If you are interested in playing this pool, send me a note, and I will get you all the information. DISCLAIMER - If you are a fed, this pool is strictly for entertainment purposes only. "Put simply, I've had it up to here with the moral hypocrisy and intellectual constipation of Bible literalists." Leonard Pitts' column from yesterday was provocative and on the money. Pitts points out that many who quote Biblical verses choose selected passages to take literally when it allows them to condemn a group or its actions. In this case, Pitts is referring to those who say the Bible condemns gays. Those same Bible quoters tend to skip over the verses that don't fit as conveniently into their own lives. It reminds me of a great scene on The West Wing when President Bartlett dresses down a thinly veiled Dr. Laura character. When the faux-doctor says the Bible calls homosexuality an abomination, the President peppers her with several other ridiculous questions based on a literal interpretation of the Scripture, primarily Exodus and Leviticus. That's my take, but Doug Clark interpreted Pitts' column differently. The News & Record's Ed Hardin wrote a scathing article about the state of Wolfpack basketball. After he wrote several nice articles about Joey Cheeks during the Olympics, I knew Ed Hardin was writing under duress while being held by aliens. It's good to see that Cranky Ed has returned. After playing well above expectations for most of this season, NC State's men's basketball season started crashing three weeks ago. Sure, the Wolfpack will still get in the NCAA tournament as about an eight seed, but they have converted from a team executing a ball control system very effectively to one that can neither score nor defend. I have never been a big fan of coach Herb Sendek. For me, he peaked at the press conference where he was named the new head coach. When asked how he felt about being State's second choice, he replied "Hell, I was my wife's third choice." That was a decade ago, and it might have been the last funny or charming thing he said. Sendek is smart and a nice enough guy, but his players leave Raleigh no better than when they arrived. That makes me believe that Sendek is so stuck on his system that the players are not being taught individual skills. I am convinced that his system will only produced pretty good teams at its best. That's not good enough for a school that sat near the top of the college basketball world not that long ago. NC State Athletic Director Lee Fowler has proven he is a puskit prone to protecting the status quo, so I doubt Sendek's job is in jeopardy. But Wolfpack fans remember better times, and they want to beat Carolina and Duke every now and then. Sendek's job may be safe, but he might want to consider jumping ship before he is forced to walk the plank a year from now. I hate to pile on, but I just read a poll of ACC players in last week's Sports Illustrated. The player they least want to play for? Herb Sendek. What a weird visual effect. Ed Cone asked an interesting question about the UNC-CH alum who tried to mow down students with a rented SUB on campus last week: "Where does terrorism begin, and angry nutjobbery end?" So when Kathleen Parker wrote "What's less clear is whether Taheri-azar is a madman, a jihadist, a terrorist, all of the above, or just a loser who happens to be a Muslim." in her column (titled "How do you spell 'terrorist wacko nutcase'?") yesterday, it sounded familiar. I am not saying Parker published unoriginal work, but I wonder if she came across Ed's blog while preparing her column. I have been a big fan of Natalie Portman since she stole the show as a 12 year old in The Professional. More recently, she has shown grown up chops in Garden State and Closer. She is a classic beauty and an OSCAR waiting to happen. But her appearance on Saturday Night Live was one for the ages. Here is the new center of our universe, John Eakes. 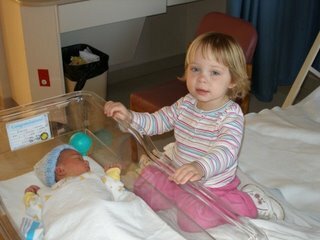 He is about six hours old in this picture. Since this picture was made, he has mastered his initial skill set pretty well - eat, sleep, poop, repeat. We just got home from the hospital, and Kristen and I are both looking forward to sleeping (a little) in our own bed again. Her hospital bed was not too comfortable, and the couch in her room wasn't that great for me either. While our sleep might not have been comfortable, all of the staff at The Women's Hospital were exceptional. We had not one complaint about any part of our experience there. They made a wonderful event even better. 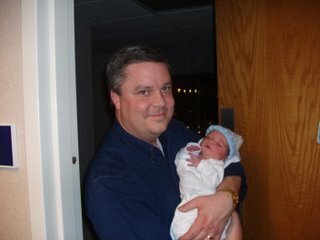 I am pleased to report that John Patrick Eakes arrived at 1:22pm today. He weighed in at 7lb, 7oz, and is 20-3/4" long. John is doing great and has been nothing but pleasant and serene since his arrival. That will change as my genetic contribution asserts itself. Mom was a whiz in labor. She barely made a peep and had young John out and screaming after 10-15 minutes of pushing. She deserved to have a smooth delivery this time, because she had a much tougher time delivering Sarah last time around. I appreciate the many positive thoughts, prayers, messages, and interesting name suggestions, and I hope to have some pictures up on Tuesday. Like most years, I am looking forward to watching the OSCARS tonight. Unlike most years, though, I have to get up at 4:30am tomorrow morning to go to the hospital. Kristen will be induced into labor, and we hope to have a healthy baby sometime on Monday. Like last year, I will weigh in with my predictions for the major awards. In past years, I usually saw most of the nominated work on the big screen, but this year I have only seen a few on DVD. In one respect, I am at a disadvantage, but many OSCAR voters admit they only watch a few of the nominated films, too. Supporting Actress: The only one of the five I saw was Rachel Weisz in The Constant Gardener, although I have Junebug in hand and look forward to seeing Amy Adams' performance. Weisz' work was soulful and worthy of an OSCAR, but this category has a history of producing the surprise winner of the evening. Michelle Williams could ride a Brokeback Mountain wave if that film gets a landslide going, but I am placing my bet on Weisz. Supporting Actor: This one comes down to George Clooney, Paul Giamatti, and Matt Dillon. Matt Dillon was great and played a pivotal part in Crash, a best film nominee. I am a big fan of Giamatti, but the academy does not seem to share that view. He should have been nominated the last two years as a lead actor, but he was snubbed both years. So I have a hunch that this year's triple nominee Clooney will get the nod. I sort of hope he wins, because his acceptance speech could be memorable. Lead Actress: It seems Reese Witherspoon has already won this category, judging by the buzz. Felicity Huffman won praise for Transamerica, but I think the earlier release of that film will work against her. I don't wager on OSCARS anymore, but if I still did, I would probably lay a bill on Huffman as my best dark horse candidate. Lead Actor: Tough category this year. Heath Ledger had the lead in Brokeback Mountain, the favorite to win best picture, but Phillip Seymour Hoffman mastered the role of the very odd Truman Capote. OSCAR likes enigmas, so I give Hoffman the nod. Hoffman made a drunken pact several years ago that he would bark his acceptance speech if he ever won an OSCAR. I might have to record the show just for that. Directing: Two words. Ang Lee. Picture: Brokeback Mountain has won every other award out there, but I am hoping that Crash will score an upset. Crash is a riveting movie with several interwoven stories. I found it to be an honest, non-judgmental movie that left me thinking about its questions long after the credits. It deserves kudos for its honesty and power about race in America. Still, Brokeback takes this category. Kristen is 39 weeks pregnant today. With her history of hypertension, the textbooks say the baby should have been induced or taken by C-section around 38 weeks. That is what happened with our first (induction, then C-section). This time, though, Kristen's blood pressure has remained low, and as a result this baby has grown much better than our first. The last ultrasound pegged this baby exactly on the 50th percentile for weight. Baby #2 will be about 50% bigger than Sarah. We are headed to Women's Hospital for a 5:45am appointment Monday morning to induce labor. That is too damn early, but it gives us a good shot of going from induction to delivery during a single nurse's shift, which starts around 7am. My mom was head nurse of labor and delivery at Women's for years, and Kristen's sister is a former labor and delivery nurse who is about to graduate from nurse practitioner school. Kristen's OB is also great, so we are in very good hands technically. Heck, I might be able to kick up my heels on Monday. I wonder if Women's has Wi-Fi? Sometime after the baby arrives, I will have a full report. Until then, we will be accepting all prayers, warm thoughts, and good vibes. I almost posted a prediction that NC State would lose to the ACC's worst team, Wake Forest. I decided to ignore my more cynical inclinations and refrained from the post. However, the Wolfpack validated my thoughts and lost by 13 to Wake, who had managed only two conference wins all year before the Wolfpack laid its egg. That means that State goes into post-season play as the coldest team in the league, unable to post a win in the final two weeks of the regular season. In the process, the Wolfpack lost a good chance to play its first two NCAA tourney games in Greensboro and probably moved into #1 Duke's half of the ACC tournament draw. Typically, State has started slow then gotten in gear late in the season. This year was the reverse, and it was cruel to get Wolfpack fans hopes up so soon. The Gate Keeper's favorite muse, Nikki Cox, appears to have had collagen injections into her fish lips. I wonder if that matters to GK? Probably not. In his column earlier this week, Leonard Pitts sent the most appropriate message I can imagine to Fred Phelps. Phelps has dedicated his life to campaigning against homosexuals, particularly those in the military. He is warped enough to organize protests at the funerals of soldiers. Protesters hold up signs with such gems as "Thank God for IED's" and "Your Pastor Is A Whore". Since Phelps has also defended spousal abuse as Biblical, I think it is pretty obvious how badly his brain is miswired. But back to Pitts' column. Pitts theorized that Phelps must be gay and have an extreme case of self-hatred to spend every ounce of his being bashing gays. If his theory is correct, Pitts has outed Phelps. In the more likely case Pitts is just funnin' with the pseudo-pastor, he served up the worst possible insult to Phelps. I liked the column either way. I never have understood why so many people spend so much time worrying about gays. Every gay person I have ever known has been defined by typical human strengths, weaknesses, hopes, and fears - pretty much like the straight population. Disagreeing with the lifestyle is fine, but no one is forced to approve, watch, or participate. For those who object to certain lifestyles they disdain so strongly that they have to take action, perhaps they should start by working in prisons to help rehabilitate inmates who actually made poor life choices, rather than protesting war heroes. Twice in my life I have been actively pursued by gay men. One worked with my sister in Greensboro, and the other was a fellow graduate student at NC State. Being pursued by a man felt strange to me, and I did not particularly appreciate their persistence. But I was sure that plenty of women had endured that type of behavior from men a lot more than I had, so I saw no reason to get all worked up about it. Singling out a group for protest, particularly those who have lost their lives in service to their country, is pretty sickening. It's also free speech. I am glad Pitts exercised his freedom of speech to expose Fred Phelps for what he is - a turd. In Like A Lion, Huh? March 1 and it's 60 friggin degrees outside....at midnight. It seems the News & Observer continues to expand its on line content, too. Their latest is a tribute to Coach K of Duke, and it's funny as hell.